Share Your Everyday Savings Tips! 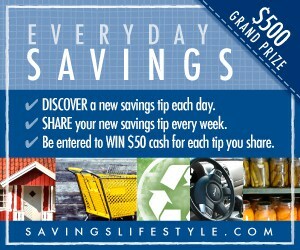 Share your Everyday Savings Tip and be eligible to win the weekly $50 Cash prize, as well as the $500 Cash Grand Prize! The campaign is now over. Please feel free to leave your tip and we will publish it on the site! Please include detailed instructions and cost if you are submitting a DIY project or recipe. If you are sharing a general savings tip, please remember to also submit WHY it saves you and HOW MUCH potential savings someone else could achieve if they were to implement the suggestion. Your email address will only be used to contact you if you are the winner. Sign me up for the FREE Savings Lifestyle daily newsletter! If you already receive the Free email newsletter, do not check this box. i.e., "How to Make...", "Cut Cost by doing...", "Frugal Recipe for ..."
Use this space to enter your Savings Tip or DIY. Please include detailed instructions and cost if you are submitting a DIY project or recipe. If you are sharing a general savings tip, please remember to also submit WHY it saves you and HOW MUCH potential savings someone else could achieve if they were to implement the suggestion. If you are a blogger submitting a tip, please submit in HTML to ensure backlinks remain in tact. If the tip is too long, consider writing a guest post instead. If you are a blogger sharing a tip, please include a link back to your site where readers can find additional details on this savings tip. If applicable, upload a photo related to your tip. By pressing the submit button, I agree to allow this savings tip be published in Savings Lifestyle publications and/or digital assets. Our goal is to share top-quality posts with the Savings Lifestyle community so we may refuse a submission and subsequent drawing entry based on quality. This will be done primarily to weed out those who submit entries solely for a chance to win. Thanks for your understanding! See the complete Campaign Rules here for more information on eligibility and the winner selection process.